Editor's note: This story marks the debut of our ongoing "Inside the Brain" series. It initially published on Sunday; we are republishing to add President Barack Obama's announcement of $100 million in funding for the Brain Activity Map project. Cambridge, Massachusetts and Atlanta (CNN) -- Ed Boyden tilts his head downward, remaining still except for his eyes, which dart back and forth between blinks for a full 10 seconds. Then, as if coming up for air from the sea of knowledge, he takes a breath, lifts his head back up and begins to speak again. During these contemplative moments, you have to wonder what's going on inside the head of this young scientist who, at age 33, has already helped invent influential technologies in the study of the human brain. It made sense when he told me, on a cold February day in his office at the Massachusetts Institute of Technology, "I guess I was always a philosopher at heart as a kid." The morning of our meeting, The New York Times had just reported the Obama administration is considering funding an initiative called the Brain Activity Map project. This is a collaboration of researchers who are seeking tools to map the human brain in unprecedented detail. A better understanding of how thoughts lead to actions, and how neural circuits lead to disease, could influence treatments for such conditions as epilepsy, autism, dementia, schizophrenia and even paralysis. Boyden is already working on such tools. If you had to make a list of all the people in the world who are innovating in neuroscience, I think he'd be at the top of it. Clearly excited, Boyden bounces from his computer, where he's getting "zillions" of e-mails about the Brain Activity Map news, to the small table where we're speaking. In December, he participated in a brainstorming session in Washington about the endeavor. After our meeting, he tells me, he'll lead a conference call with other researchers about next steps. On Tuesday, Obama unveiled $100 million in funding for the initiative, dubbed Brain Research Through Advancing Innovative Neurotechnologies, or BRAIN. The White House says it "aims to help researchers find new ways to treat, cure, and even prevent brain disorders, such as Alzheimer's disease, epilepsy, and traumatic brain injury." The Brain Activity Map proposal is mainly about innovative collaborations in neuroscience, which are taking place anyway. Boyden is a co-author of a new paper in the journal ACS Nano, describing the value of nanotechnology tools in mapping the brain. His efforts are being rewarded, as evidenced by the hodgepodge of awards in his office (as well as a certificate for "Mr. Most Likely To Be Late Because He is Teaching Students How to Build a Microscope"). In mid-March, Boyden won the €1 million Grete Lundbeck European Brain Research Prize, shared with five other scientists, for his pioneering work in using light to manipulate the brain. "If you had to make a list of all the people in the world who are innovating in neuroscience, I think he'd be at the top of it," said Garrett Stanley, associate professor of biomedical engineering at Georgia Institute of Technology. When you electrically stimulate one part of the brain, a lot of nerve cells called neurons get hit at once. In order to understand what particular kinds of neurons do, there needs to be a way to target them separately. For this, Boyden and colleagues turned to nature. "All over the tree of life, you can find organisms that use molecules to convert light into electricity for photosynthesis or photosensation," Boyden said. One example is single-celled algae, which has a small eye spot -- a brown sphere -- that senses light, prompting hairlike structures called flagella to move and making the plant effectively swim. What if you could take a small piece of DNA from the algae and transplant it into a neuron so the neuron now produces a light-sensitive protein (and installs it on the cell's surface)? Then, Boyden and colleagues reasoned, you would have a neuron that could be turned on or off with light. As a graduate student at Stanford, Boyden would often get into late-night conversations with Dr. Karl Deisseroth, who was an M.D.-Ph.D. student at the time working in the same lab. Deisseroth and Boyden began exploring their common interest in how to control specific types of neurons in the brain. Together, they came up with the idea of inserting light-sensitive proteins in particular kinds of neurons. It was August 4, 2004, around 1 a.m. when Boyden put a dish of cultured neurons under a microscope. The neurons were genetically altered with a light-sensitive protein called a channelrhodopsin. He shined a blue light at them. Amazingly, on the first try, the technique worked. Boyden recalled that night of scientific discovery in an essay published online by Faculty of 1000. He wrote: "I e-mailed Karl, 'Tired, but excited.' He e-mailed back, 'This is great!!!!!'" The data that Boyden collected that night demonstrated the ideas he and Deisseroth would later formalize in a 2005 Nature Neuroscience paper. Around that time, the term "optogenetics" was born to describe what they were doing. Deisseroth is also a co-recipient of the recent European brain research prize. Today, at least 1,000 neuroscience groups worldwide are using optogenetics to study the brain. The technique has so far been used in monkeys and mice to control their behavior, which has its own importance because it can yield new insights about the brain in general, Boyden said. Developing treatments for humans is another goal, but for reasons of ethics and complexity, that takes a lot longer. Being able to turn individual cells on and off could be powerful in finding therapies for brain disorders. For example, researchers could explore whether particular kinds of neurons are involved in the symptoms of schizophrenia, and selectively turn those off while leaving neurons essential for thinking intact. This also has implications for treating addiction. In one experiment, scientists altered a mouse's brain so dopamine neurons -- involved in the sensation of pleasure, as well as addiction -- could be turned on with light. They delivered brief light pulses through optical fibers, prompting the mouse to stick its nose in a small portal over and over. "An activation in these neurons lasting one-fifth of a second is enough to make the animal do more of whatever it was just doing," Boyden said. Neurons can also be selectively silenced with light when they express other kinds of proteins. This is an avenue of exploration for treatments for epilepsy, a condition in which an excess in activity of neurons produces seizures. Optogenetics may also prove crucial to creating a treatment for blindness; the idea is that you could make cells light-sensitive, converting the eye into a camera and restoring vision, Boyden said. "The tools he's developed are so broadly applicable," said Craig Forest, assistant professor at Georgia Institute of Technology. "Is it a stretch to say it's like the microscope for the brain?" He adds, "Optogenetics is the, kind of, microscope for neuroscience right now." The seeds of Boyden's career were planted in childhood. Growing up north of Dallas, he wanted to understand something about humanity and why we are here. He liked math better than science at first: "Math was the way of getting to the inner truth of things," he said. But then he wanted to know how our minds are able to understand math. His thoughts gave way to an idea he now calls the "loop of understanding": Math is how we understand things at a deep level, our minds do math, the brain gives rise to our minds, biology governs our brains, chemistry implements biology, the principles of physics rule over chemistry, and physics run on math. It's a loop from math to math, with all the knowledge in between. "I don't think I came up with that eloquent way to describe it until I actually came to MIT, but yeah, I was very interested in these kinds of things as a young teenager," he said. His interest in science wasn't entirely a surprise; his mother has a master's in biochemistry, and conducted research on nicotine, but stayed home to take care of Boyden and his sister. His father was a management consultant (both parents are now retired). "I was really a workaholic from age 10 onwards, I guess," he said. Boyden remembers a statewide science fair in Texas when he was 12, where science-minded kids went to present their research. It's hard to get him to talk about it now, but when I pressed him on the topic, he admitted, matter-of-factly, that he won the fair. "Oh, you did! Do you remember what it was?" I asked of his project. Boyden looked slightly uncomfortable, as if it were an embarrassing secret. "Uh, it was an area of geometry that has to do with the number of points on a plane and how they're connected and so on. It's not very easy to explain, nor frankly anything valuable." However trivial his school-aged projects seem in retrospect, Boyden got to skip two grades. He enrolled at MIT when he was 16. On campus, he chose to live in a dormitory with a partying reputation. "I was very quiet, and so I went there to try and learn how to interact more with people," he said. 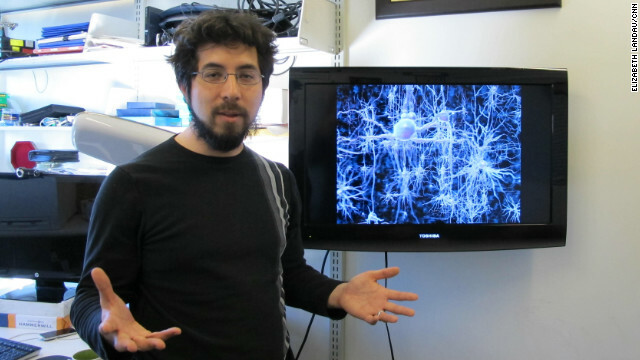 Ed Boyden leads the synthetic neurobiology group at MIT. Today, he seems to have no trouble in that regard. Said Forest, who works on technologies with him to study individual neurons, "Not only is he just an incredible innovator, but he is just a really nice guy." When Boyden arrived at Georgia Tech in February to give a lecture in the "Young Innovators" series, his puffy North Face jacket, slightly tousled curly locks and frizzy beard contrasted with Forest's pressed suit, lilac collared shirt and short salt-and-pepper hair -- almost like an Apple vs. PC commercial. The two communicate almost every day. It's obvious how much respect Boyden has for his collaborators. Speaking to a standing-room-only lecture hall lined with dozens of students and faculty members, he spent the last minutes of his presentation reading off the names of students, post-doctoral fellows, collaborating groups and funding sources from a projected slide that listed even more of them. Then, he looked to the crowd and, almost in a whisper, said, "Thanks." The two met at a social event at the MIT Museum while Forest was working on his Ph.D. at MIT. At that time, Forest was developing an instrument for genetic analysis involving thousands of glass tubes. Boyden told him about his own work in neuroscience, and about a problem that involved glass tubes for measuring neurons. Forest didn't know anything about neuroscience, but he and colleagues "had a lot of expertise in how to build great devices," Boyden said. The two researchers realized they could combine forces by creating a bundle of glass tubes, similar to what was being used for DNA analysis, for recording the electrical activity of individual neurons. Neuroscientists often use mice, which have brains that structurally resemble those of humans, to test new technologies. Mice were the subjects of their first tests. "We had no idea what we were doing at first," Forest said. "We went from a bundle back to one tube. We got that to work after three years of trial and error." Those years paid off. 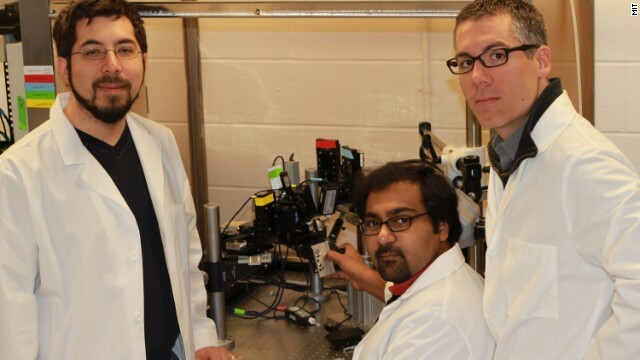 Boyden and Forest, working with Forest's graduate student Suhasa Kodandaramaiah, developed a robotic system to record activity of a single neuron in the living brain using a tiny glass tube. The general technique, which has been around for about 30 years, is called "patch clamping," but this is the first time it has been fully automated through the assistance of a robot. The researchers have demonstrated the effectiveness of this technique in living mice, both awake and asleep. Scientists know that the tube -- the "micropipette" -- has hit a neuron by measuring the electrical resistance between the tube and the brain. Resistance increases dramatically when the small needle bumps up against a neuron, as the tube forms a tight seal with the nerve cell. "At that point, neuroscientists get very excited because you have the ability to hear the electrical activity of that single cell," Forest said. "Despite all the firing of millions of neurons in the neighborhood, once I form that seal, I can hear that one with exquisite sensitivity and precision." There are only about a dozen of the automated patch-clamping robots in the world, but it's not Boyden and Forest's intention to keep them a secret. On the contrary, they've posted the complete plans for the robot on the Internet so anyone can download them and create their own. "I would argue, if you really understand how the mind computes your thoughts and emotions -- things like sharing credit, teaching and doing good for humanity become natural," Boyden said. The researchers are also working on a scaled-down version that would cost less and be more portable. They have spun off an Atlanta-based start-up company called Neuromatic Devices to sell the finished products, but neither holds equity in it. Optogenetics can be combined with automatic patch clamping to identify neurons of interest and then measure their activity. The robot could also perform single-cell surgery. Forest's group has already used the robot idea to simultaneously record intracellular activity from more neurons than anyone else -- only three, surprisingly -- in a live mouse. The Brain Activity Map's ambitions involve interceullar recordings thousands to millions of neurons at once. When compared that way, the current neural recording technology is like a steam engine, while we need a rocket ship, Forest said. "We've got a lot of work to do, and our hope is that this just plants some initial seeds towards that endeavor," he said. MIT researcher Ed Boyden (left), and Georgia Tech researchers Suhasa Kodandaramaiah (seated) and Craig Forest collaborated on a robotic system. One of the people e-mailing Boyden after The New York Times story was George Church, who has published research with him in the past. Church was one of the leading figures of the Human Genome Project, and a current backer of the Brain Activity Map. Optogenetics, combined with high-density optical fiber arrays, could be a promising tool in the quest to map the brain, Church said. In other words, researchers can then use optic fibers to manipulate multiple neurons that activate in response to light. High-density optical fiber arrays would offer more, and thinner, probes for neuronal exploration than bulky electrodes. Boyden and colleagues are also working on three-dimensional brain interfaces, manufactured in a way similar to computer chips. Rather than having computer circuitry on them, they have dense electrodes that would allow research to pick up on the activity of many neurons at once. The data from recording so many neurons will require a huge amount of computer storage; for recording the entire brain at once, it would be mind-boggling. "Most of neuroscience has gone on with people studying one part of the brain at a time," said Georgia Tech's Stanley. "Here's somebody's lab over here that studies this part of the brain, there's somebody's over there that studies that part of the brain. Putting it all together is really a tough problem." People don't like to talk about enhancing the brain, Boyden said; it makes people uneasy to think about designing or engineering a way to sharpen our minds. Yet plenty of people take pharmaceuticals -- sometimes without a prescription -- to help themselves focus or be less anxious, and caffeine and alcohol have been around for centuries. "I think the most important thing is for humanity to openly discuss this topic," he said. "If we can discuss it, and we also can talk about side effects, should we maybe try to design more optimized versions of things?" Enhancing his own brain was something Boyden thought about long before he became a neuroscientist. At 18, he was taking six courses per term, all graduate-level. Feeling overloaded, and also curious about what it would be like to take a drug that focuses the mind, he went to the campus psychiatrist and got a prescription for Ritalin. He doesn't remember anyone telling him to just take fewer classes. The drug did make him focus, a lot. He took one pill when he woke up and another just before plasma physics class, "so I don't remember much from that term except for plasma physics," he said. I think you really need to understand how your mind computes your thoughts. But after a couple of months he stopped taking the Ritalin. He's not clear on whether the drug altered him permanently, or whether he just learned to focus better, skills for "how to simulate some of those processes in my mind." Academically, Boyden never slowed down. On his 25-page resume, he lists perfect, or more-than-perfect, GPAs throughout high school, college and graduate school. 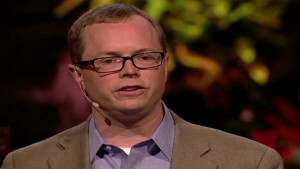 At Stanford, he met his now-wife, neuroscientist Xue Han. They have published research together and are raising two young children. His "spare time" goes to his family. In the last six years, he's found something new to calm himself and concentrate: meditation. He meditates every day when he wakes up, incorporating a structure called "internal family systems," which involves looking at all the drives, thoughts and desires in your mind. "By showing compassion for them, you can get them to become less polarized and work with them and negotiate between them and it's very powerful," Boyden said. I was surprised when he said he didn't know anything about the neuroscience behind meditation, which is a hot topic among other researchers, nor did he care about it as far as his own practice. "I think that people should be careful about the need to see something in the brain to justify its worth," he said. "If you don't see anything in the brain, that might just mean the resolution of our brain (scans) just isn't good enough yet." You can tell Boyden thinks a lot, for his own curiosity, and his vibe is more "grad student"-like than professorial. His frizzy beard resembles the thin branch-like connections between neurons that he's talking about. Every time he runs his hand through his curly brown hair, it falls down in a different unkempt way. He's thinking these days about what is needed to "solve" the brain, which he believes could be done in 40 years. "Solving" it would probably involve understanding what gives rise to a thought or an emotion, as well as maps of molecules and circuits that allow the design of therapeutic interventions. Building technology platforms that enable this kind of research -- so "we can repair the brain" -- is one of his core hopes. Stanley isn't sure all that can happen in the next few decades, but he does envision that it's possible that, just as cancer can be a chronically managed disease, disorders of the nervous system may be able to go in that direction. Forest chimes in: "There are prosthetics today, and those will continue to improve; these things exist in a rudimentary form today," he said. "Over our lifetimes, we will see increasing roles for technology in managing disease states." Boyden admitted to enjoying the prominence of his work insofar as it makes more people invested in turning these ideas at the frontiers of brain science into reality. "I think you really need to understand how your mind computes your thoughts," Boyden said. "I think that's incredibly important, so I like the fact that the prominence means the field and people entering it (and), you know, the world, want to make this happen." Attention doesn't seem to be what's driving him. He's a man of many ideas, and wants to understand the biology behind where ideas come from. "I guess I'm still drawn by the philosophy," he said. When we stumbled on Durex's Fundawear -- a long-distance, app-controlled underwear stimulator -- we simply had to investigate. Will this be floating over your town? The first time you see this bizarre aircraft floating high above the horizon, you may be confused. It looks kind of like a giant, winged doughnut. There's something new on the horizon that could revolutionize this burgeoning technology: 4-D printing. For the past two years, she's been a pocket and purse accessory to millions of Americans. You played it as a kid, but now check out this giant version of the game Mousetrap. Kathryn DiMaria isn't quite old enough to get behind the wheel, but that hasn't stopped her from building a Fiero. When is bug spray more than just bug spray? When it's a compound that is thousands of times stronger than DEET, works on many different insects and could save lives. Keller Rinaudo of Romotive talks about the company's new personal, programmable robot, Romo. Jay Silver, inventor of MaKey MaKey, shows how to use anything to interact with computers and why that is valuable. What if everything you thought you knew about education was wrong? The idea of "wearable robots" may seem like something out of a movie, but this technology is already being used in real life. Brian Preston, founder of Lamon Luther, employs homeless craftsmen and helps them get back on their feet.